Question: How did you build two such amazing businesses completely bootstrapped? Answer by Bhavin: When it comes to running a business, entrepreneurs have to steer away from what I like to call the ‘sins of overfunding’. To be successful, you must focus on value as opposed to valuation. I see so many startups these days trying to glamorize the billion-dollar valuations. But, to me, building a business is a very simple formula–you want to ensure that the value you create for your customers is far greater than the value you ask from them. Unfortunately, because of all these regular funding cycles, the focus now has shifted to valuation. The problem with that is, when you start focusing on valuation you start looking at the wrong metrics such as GMV, eyeballs, number of users, etc. However, when you focus on delivering value, you look at customer satisfaction or customers willing to pay me. Moreover, with overfunding, a lot of businesses start substituting creativity with cash. And this is a simple mistake to make. Being bootstrapped has helped us deal with challenges in a creative way instead of simply using the money to solve the problem. Q: How do you and your brother/business partner divide the work between all the different ventures you have? A: When it comes to running a business together, who you are working with makes a huge difference. In our businesses, we do not have any formal role segregations. In fact, more than segregation of responsibilities, I believe that having a really good co-founder has a great positive impact on your business. Working with my brother and my other co-founder, Ramki Gaddipati with whom I founded Zeta in 2015, has been phenomenal because it helps to have somebody whom you can trust and bounce ideas off, get automatic lateral thinking and share different perspectives. Had Ramki and I started our own individual companies, we probably wouldn’t have achieved the growth we have today. Q. What inspires you to start one company after another? A: I have always believed that we have a moral obligation to make an impact that’s proportional to our maximum potential. Each of us has been given the gift of mind and body and each of us should look back and feel that we did the best and made an impact to our fullest potential. That has always driven me. And this is just the beginning. I still have a long way to go. Q: You spend a lot of time on your new baby, Flock. Tell us more about it. A: Flock is basically an enterprising collaboration in the messaging and productivity space. Productivity, efficiency and empowering people to maximize their potential are things I’m deeply passionate about. Flock was created to empower individuals and organizations to maximize their communication efficiency and productivity. We did that by creating software that can be used by teams and by organizations to increase their productivity. We initially started with developing an instant messenger. But we are constantly building software products to improve communication and collaboration between enterprises. Q: When it comes to Radix, what are you proud of and what do you think you could have done better? With Radix, the one thing I’m truly proud of is the team that I have. I work with such smart individuals who often challenge my ideas and prove me wrong–which is really insightful. I’m proud of creating a team and culture that enables us to be at a place that we’re now at and keeps pushing towards doing better than we did yesterday. In terms of doing better, there are some TLDs that we missed out despite doing such data-driven research. There were some gaps that we could have filled. They are all lessons well learned. A: There are three things that have been close to my heart and fundamentally important to my organizations. I believe in building businesses that provide value. Money and profit are side effects that happen when you consistently create and deliver value. It is the only thing that will take your business a long way. Hiring and maintaining the best talent is a philosophy that is deeply ingrained in our company culture for a decade and has made a dramatic amount of difference. For instance, take some of the best teams in the world; the amount of effort they take to draft the best players; they track each player’s scores and performances and keep pitching to ensure they have the best ones on board. How many businesses can say that they spend that kind of time and energy to hire the best talent? In fact, we keep increasing the bar every year–so much so that sometimes I’m afraid that if I interviewed for some of the positions in my company, I wouldn’t get through. We are always aiming to hire the best of the talent in the industry across the globe. Running a successful business is very similar to playing any sport. Everyone’s eyes are always on the scores. They are all focused on taking the score to another level. Every aspect is measured including the wind speed, the past statistics, season innings, and they are all put out there for everyone to see. I strongly believe that you cannot improve something you don’t measure. Constantly measuring stuff will eventually lead to improvement. Q: What do you think about the new technologies such as blockchain and AI? What kind of influence can they have on the domain industry? A: Some of these new technologies have amazing potential to make a dramatic impact. Blockchain has great potential providing a completely new and transparent way of handling data. The math and the concept behind it are really fun. AI on the other hand has a truly deep potential—both positive and negative. In the course of our lifetime, we will definitely see a significant impact. Driverless cars and more such innovations will have a tremendous impact on the way we function. When it comes to the domain industry, the reason I love it so much is that it is simple and devoid of any over-complication. People who have tried to complicate this industry in the past have invariably failed. To me, a TLD is a TLD—it’s an address. 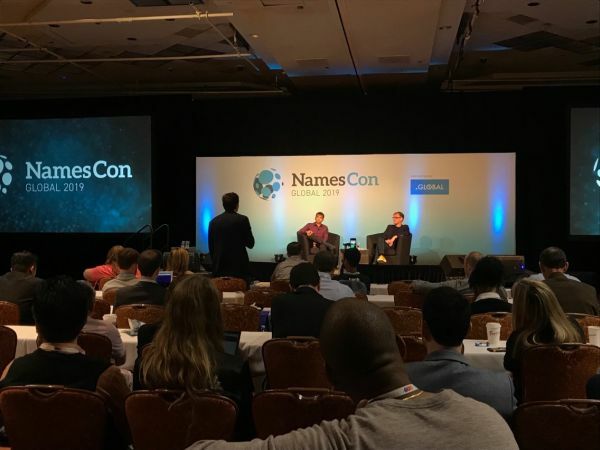 Domain names are here to stay because there is always going to be a network and there will always be resources in this network—be it people, machines, devices, etc. The moment you have a network and resources, you need an address to point to that resource. And if you try to complicate that with blockchain or bundle them with a digital ID or AI, it will fail. Domain names and DNS are doing one thing and they are doing that really well. Q: What are your thoughts on the future of domains? A: Domain names and DNS are like utility service. We’re not going to stop using electricity, we’re not going to stop drinking water, we’re not going to stop requiring domain names. Yes, we can have apps on cell phones, we can have Siri and Alexa. But at the end of the day, resources on a network will always be on an address. Unless somehow the Internet stops existing and we communicate with each other through telepathy. Even then you’ll need an address. Q: Radix is in domains, Zeta is in payment and Flock is in communication—how do you develop expertise in three different sectors? A: With Radix, I already had 12 years of legacy in the domain industry so the information and knowledge were there. Zeta was the fruit of my passion for (digital) payments. I’ve always been passionate about the payment space. It frustrates me that cash still exists. We live in a digital world and it’s sad to see that the digital forms of transactions are not as efficient as the offline forms of transactions. When communication became digital, it was instant and it came at zero cost. But if I pay you money through a credit card, you get it 48 hours later and you have to pay 2 percent on top of it. In the payments industry, there are all these anomalies that really frustrated me. This was a space where I truly wanted to make a change that helped hundreds and millions of people around the world. This passion led me to Zeta. My co-founder and I started talking about this in 2014 and I spent a year just studying everything from Central Government frameworks on cash and currency to enterprise payment solutions, the kind of technologies that banks used, how digital payments flow, legal aspects, technical aspects and more. Then, a year later, we decided the areas we wanted to start with. By the beginning of 2015, we had a business plan. In April 2015 we got our first 6-7 programmers and started building the first version of our platform and we launched 6 months later. The advantage that we brought to Zeta was because we studied it fresh and applied those principles. We weren’t tainted with existing knowledge. We learned everything from scratch. Today we have 11 million dollars worth of transactions every year. Q: How does Radix maximize the lifetime value of a customer for the company? A: At Radix, we don’t intend to sell any other products other than TLDs. DNS and domain names do one thing well and that’s our business. Our whole objective is how can we get our registrar partners to best cater to their customer’s needs when it comes to buying domains and continue to use it thereafter. I honestly think we have a unique opportunity to be at the starting point of the web presence of a company or an individual. With domains, they are beginning the journey of their online presence and over the course of time, there are tons of products that they will need such as SSL, a shopping cart, a website builder, etc. These are value adds that registrars will have to look at to survive the competition. We also need to have active communication with our customers. The more we do that the faster we’ll be able to innovate and provide true value. If we start creating products and services that the new businesses need, we have a great opportunity to increase revenue, usage, retention, and more. Building a business takes a lot of hard work and sacrifice. Most entrepreneurs experience many years of setbacks, frustration, and learning experiences before they achieve success. And irrespective of what stage you’re at, there are always other people and companies that you can learn from.